I was appointed by the Scottish Executive as Managing Contractor of the Healthy Scotland Convention 2001 (HSC 2001), a participative one-day conference, held at the Edinburgh International Conference Centre for over 300 key players from the health sector, national and local government, and representatives from other public, private and voluntary sectors throughout Scotland to exchange information, experience and ideas on improving Scotland’s health. The programme was facilitated by me and my associates, and featured presentations from Scottish Ministers, the Scottish Executive’s Health Department, the NHS in Scotland, the World Health Organisation, the Public Health Institute for Scotland, the Health Development Agency of England, and the Community Development and Health Network of Northern Ireland. The approach and facilitative style chosen for HSC 2001 was positive and participative. Appreciative Inquiry (AI) processes were used. AI is an organisational development tool, which challenges the problem-solving approach to the management of change. The traditional approach to change looks at what is not working, tries to diagnose problems and find solutions. The focus is fragmented and on what is wrong. Appreciative Inquiry only engages with what works — what is going well and about which there is enough positive motivation to make it even better. The focus is on the whole system — everyone who affects and is affected by the issues under discussion — and is wholly positive. Further information on the process in my blog on Appreciate Inquiry. Every day in Scotland, those who are concerned with health and wellbeing are aware that some things work, and work well. 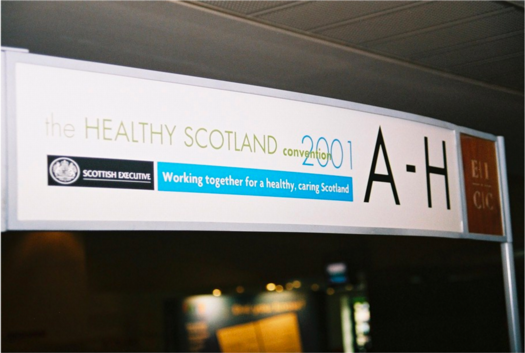 The tangible results of HSC 2001 are findings that describe where Scotland wants to be in terms of its public health achievement, based on the best of where it already is and has been. 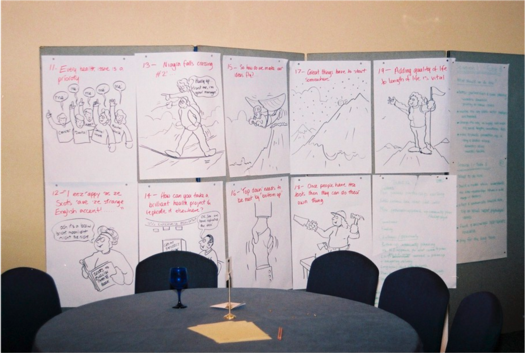 The methodology was based on storytelling — people telling their stories to each other, and discovering that other people feel the same about what they want for Scotland’s health in the future. …in Northern Ireland from Ruth Sutherland, Director of the Community Development and Health Network. 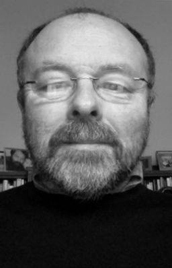 What is happening in Scotland in comparison to the experience, practice and vision elsewhere? What is going well and what challenges remain? What would a step-change in health look like? What should we do now to make a real difference? Young People’s Health — Schools, ‘Walk the Talk’, etc. Participants signed up to attend these sessions over the lunchbreak, and sessions were doubled or cancelled, depending on demand. The session on Mental Health was doubled, and the session on Better Housing was cancelled. 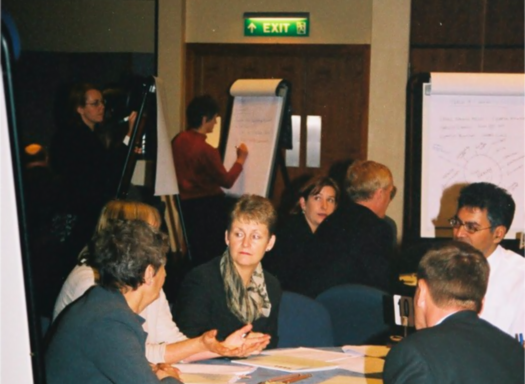 The Open Space format was designed to allow participants maximum freedom to discuss whatever aspects of these topics were of interest with whoever was interested in participating in the discussion. 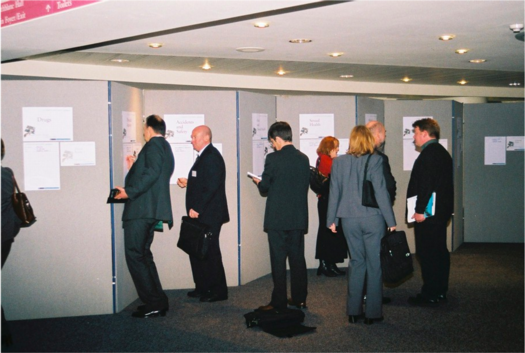 Participants were encouraged to visit other sessions, particularly if they found that they were not contributing to, or benefitting from, any session. At the specific request of the Minister, each session was moderated by a member of the Scottish Executive staff to ensure that the discussions were relevant to their theme, and to input information on the topic under discussion from the White Paper Towards a Healthier Scotland. Most sessions also featured discussants, who were able to illustrate the topics with examples of recent accredited good practice in their organisation or area of expertise. what further help and support they would want from the Scottish Executive. The programme then featured an address, originally scheduled for earlier in the day, on Health and Social Justice: Twin Priorities from Jackie Baillie MSP, Minister for Social Justice, and concluded with an address on Achieving a step-change starting NOW from Trevor Jones, Head of the Scottish Executive’s Health Department and Chief Executive, NHS in Scotland.